After a long battle fraught with a lot of resistance, Uber drivers are finally poised to receive tips as part of their payment for shuttling customers around, the ride-hailing company announced Tuesday. The application of an in-app tipping function set to be rolled out nationwide by the end of July, comes as Uber tries to turn away from the onslaught of crises that have badly damaged its public reputation since February. The tipping option is already available in Seattle, Minneapolis, and Houston and is rolling out to more cities as the company learns to streamline the process. Drivers have recently suffered from declining fares, with high turnover a chief problem for Uber. The issue of shrinking fares came to a head earlier this year when Uber CEO Travis Kalanick was caught on camera berating his Uber driver during a discussion about the issue. Since then, a series of scandals has rocked the company, culminating in an investigation led by former Attorney General Eric Holder meant to clean up Uber’s allegedly toxic and sexist corporate culture. High-profile executives have fled the company, and Kalanick embarked upon an indefinite leave of absence last week. In a survey conducted last year, Uber and Lyft drivers said tipping was a necessary means of financial stability and survival. The company’s main competitor, Lyft, has long offered an in-app tipping function. 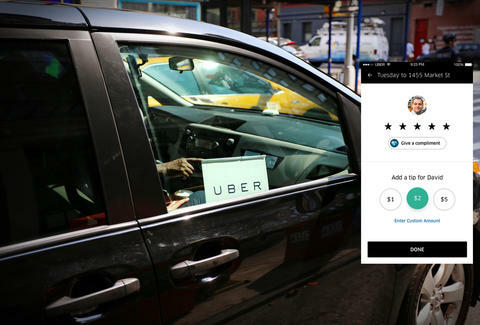 For customers curious about leaving tips for an Uber driver, the process appears to be pretty easy, with the option to leave a custom tip or a preset gratuity after the ride ends. You'll just have to brace yourself for paying a little more for your rides.